December 25th is just around the corner, and these last days before Christmas carry with them excitement, anticipation and peace, and deliver joy to billions of people around the world. While there are a number of theories about the origin of the Christmas holiday, nobody can argue about the origination of the word “Christmas”. According to an article entitled simply Christmas, found on Wikipedia, the word “Christmas” actually comes from the term “Christ’s mass“, which originated from the Old English phrase “Cristesmæsse” which was first recorded in 1038. In approximately 1131, it was replaced by the word “Cristes-messe“. “Cristes” comes from the Greek word “Khristos“, which actually means “Messiah“, and “mæsse” is a variation of the Latin word “missa” which is the celebration of the Eucharist. 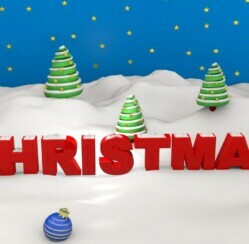 Historically, the Christmas holiday has been well known by a variety of other names in different cultures. Anglo-Saxons, for example, referred to the celebration as “midwinter” or “Natiuiteð“, which is translated from the Latin word “nativitas“, which means “nativity” or “birth“. In Old English, the term “Yule” was used to describe the celebration during the months of December and January that is often considered the equivalent to the Christian celebration. In the late 14th century, the word “Noel” was introduced into the English language, which is derived from the Old French word “noël” which means “day of birth“. Another common word that is frequently used to describe the holiday is the word”Xmas“. I have to admit that over the years this term has been a real pet peeve of mine. I have always thought that calling the celebration “Xmas” was an attempt at removing Christ from the holiday, and to be honest, it offended me. It wasn’t until recently, when I did some research on the origin of the word “Christmas” that I came across the true reason that the holiday is often referred to as “Xmas“. The answer is actually quite interesting, and I have to say that I am a little bit ashamed of myself for being so judgmental without having a true understanding of the abbreviation. According, once again, to Wikipedia, the use of the term “Xmas” actually dates back to the 16th century, and in spite of the common belief that its use is a secular attempt to extract Christ from the holiday, the “X” is actually a variation of the word “Christ“. It stems back to the Greek letter “Chi“, which is the first letter in the Greek word “???st??“. This word, ironically translates to English as “Christ“. Apparently I am not the only one who, due to lack of education on the matter, was offended by the famous “X” however. A number of famous evangelists had the same misconception that I did, it seems. It all goes to show us, no matter how much we think we already know, there is always something new to learn. Which term do you and your loved ones use to describe Christmas? How do you feel about the term Xmas?